Lately I have been feeling like an adult baby, my schedule is mainly eat, read, and sleep. Repeat. Between my nutrition coursework at Hawthorn, my personal informational reading and my fun reading, my nightstand is getting a bit crowded. The best part about my school books (this time around) is that I am really enjoying the required readings; this is a new concept to me since my undergraduate work was less than appealing. Here is a peak into what is currently in the EnjoyableMe library. Not only are these books informational, educational and enjoyable, they look so pretty right? 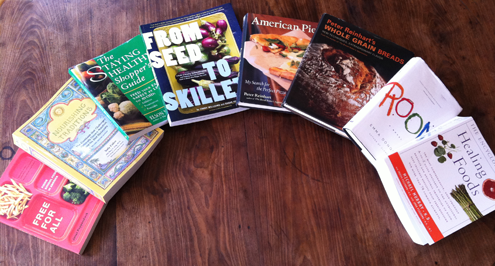 Starting from the left we have Free For All: Fixing School Food In America by Janet Poppendieck. Janet Poppendieck is a professor of Sociology at Hunter College and the author of a handful of books that peek into our food systems. This book gives an inside look at the nation's sad school kitchens and a large scale vision for change; I have yet to read the entire book but I am looking forward to reading the rest of her collection. Next up is one of my school books, Nourishing Traditions: The Cookbook that Challenges Politically Correct Nutrition and the Diet Dictocrats by Sally Fallon. Sally is a well known author, chef, and nutrition researcher who bases her work around the research of Dr. Weston A. Price, a dentist who traveled the world in the 1930's studying the diets of isolated traditional societies and comparing those to industrialized societies. What his research found was that there were a few commonalities across all of these isolated groups such as eating animal fat and proteins along with vegetables and whole grains. When compared to their relatives who were eating an industrialized, refined diet there was a significant increase in disease, tooth decay and infertility. This book features both informative chapters and many pages of correlating recipes. Another one of my required readings, The Staying Healthy Shopper's Guide by Elson M. Hass is a nice concise reference book that breaks down the key items to be aware of and to look for when shopping for your food. This book has some great chapters on pesticides, food processing, additives and drinking water. This next book From Seed to Skillet: A Guide to Growing, Tending, Harvesting, and Cooking Up Fresh, Healthful Food to Share with People You Love is one that I just recently ordered. The author, Jimmy Williams, learned to grow his own vegetables by working side by side in his grandmother Eloise's garden. Today Jimmy sells his vegetables and seeds at farmers markets in southern California; he has also expanded to helping people design their own home gardens. I have only browsed the book so far but the photographs are amazing and the recipes look simple and delicious; I am excited to start my own garden in the very near future and this book will be a great resource. American Pie: My Search for the Perfect Pizza, is one of those books that will make you hungry for pizza no matter what time of day it is and for someone like me with a serious pizza weakness this can be bad news. I purchased this book for some ongoing research into the wonderful world of pizza. My dad has a dream to create the ultimate pizza- tasty and healthful, and I have been chosen as the lucky one to make this happen! Peter Reinhart is a master bread maker and this book follows his journey from Italy to the United States in search of the perfect pizza, prepare to drool! Because our mission to create the ultimate pizza requires this pizza to be nutritious, we have decided that it must have a whole wheat crust. As I have mentioned in many of my posted recipes, baking with whole grains can add an additional complexity to the recipe but it is absolutely possible. Peter Reinhart's Whole Grain Breads: New Techniques, Extraordinary Flavor is just the book to teach me how to make our whole wheat crust a reality. This book goes into scientific detail about the processes necessary to turn whole grains into wonderful eats. So far I have only focused on the pizza dough but I look forward to trying all of his expertly perfected recipes. There will definitely be some upcoming pizza posts to look forward to so keep an eye out for them! Don't worry, not all of my books are about food, I have been recently sucked into the novel Room by Emma Donoghue after it was recommended by D'mom. I am about three quarters of the way through it and I am hooked! It is told from the perspective of five year old Jack, who with his mom has been prisoners in Room for seven years. Jack's curiosity and naivety are endearing as he navigates the only world he has ever known, the eleven by eleven square foot shed filled with Wardrobe, TV, Tooth and the rest of his friends. I highly recommend this book, it is definitely one of those fun reads that you hate to put down. Last but not least in this rainbow is The Encyclopedia of Healing Foods by Michael Murray. This book was part of my required class reading but I would recommend it for everyone since it is a really great resource for the medicinal implications of foods, all nicely broken down into easy to navigate food groups. Fun post and great selection!